The advent of social complexity has been a longstanding debate among social scientists. Existing theories and approaches involving the origins of social complexity include environmental circumscription, population growth, technology transfers, prestige-based and interpersonal-group competition, organized conflict, perennial wartime leadership, wealth finance, opportunistic leadership, climatological change, transport and trade monopolies, resource circumscription, surplus and redistribution, ideological imperialism, and the consideration of individual agency. However, recent approaches such as the inclusion of bioarchaeological perspectives, prospection methods, systematically-investigated archaeological sites along with emerging technologies are necessarily transforming our understanding of socio-cultural evolutionary processes. In short, many pre-existing ways of explaining the origins and development of social complexity are being reassessed. Ultimately, the contributors to this edited volume challenge the status quo regarding how and why social complexity arose by providing revolutionary new understandings of social inequality and socio-political evolution. 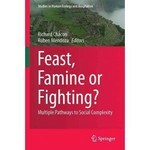 Chacon, Richard J. and Mendoza, Ruben, "Feast, Famine or Fighting? : Multiple Pathways to Social Complexity" (2017). Faculty-Authored Books. 11.